Stone’s forthcoming October-through-December Piedmont tasting menu at his Beverly Hills restaurant offers an elegant but rustic take on the region. “There’s a real mystique and romance,” L.A. chef Curtis Stone says of Italy’s Piedmont region. 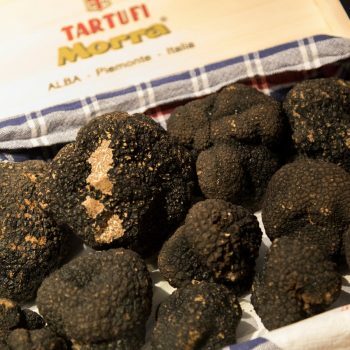 “The truffles are fantastic. The Barolo is every bit as good.” Stone also loves how Piedmont, with its location at the foot of the Alps, can feel “autumnal and wintery even when it’s hot.” It’s a place where people eat pastas and braised meats, including a lot of veal, year-round. 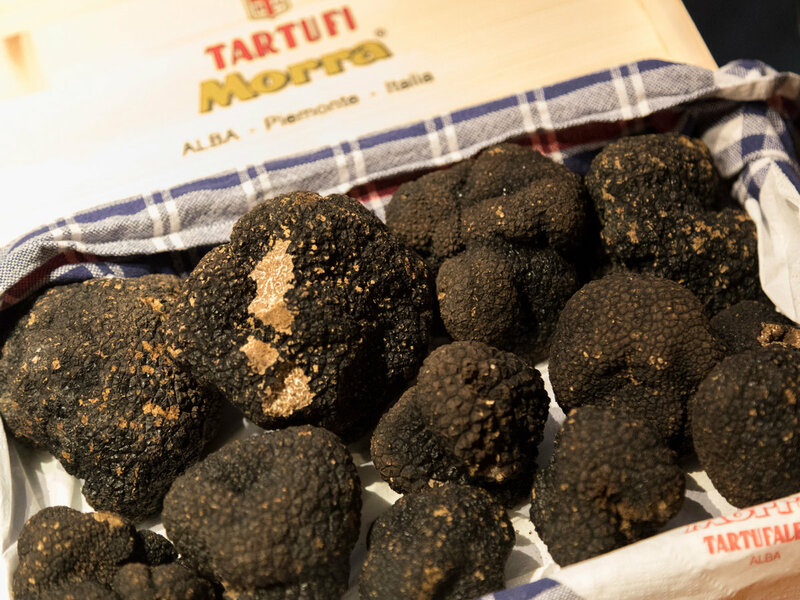 Hearty dinners paired with Barolo and Barbaresco provide lots of comfort here, while truffles add striking hits of luxury. 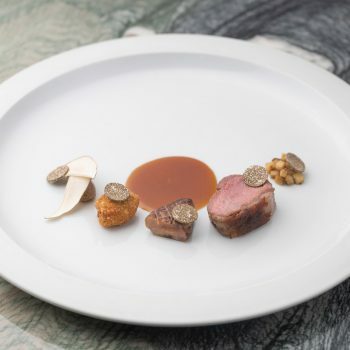 So Stone’s forthcoming October-through-December Piedmont tasting menu at Maude in Beverly Hills will offer an elegant but still rustic take on this part of northwest Italy. “Some of it is interpretive,” Stone says of the menu. “Most of it is pretty straight down the line, and it lends itself to big powerful flavors like black and white truffle.” There’s ravioli filled with braised veal and topped with black truffle. 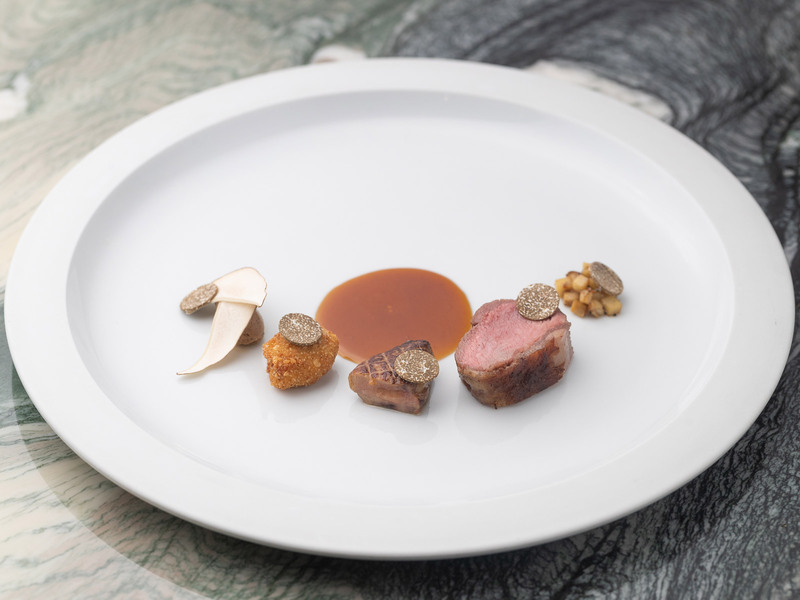 There’s also Marin Sun Farms young beef with foie gras, sweetbread, and coins of black truffle. The Marin Sun Farms meat, from milk-fed California calves that are allowed to freely room and eat some grass, is like a hybrid between veal and beef. The tasting menu, which Stone expects to cost $175 and include around eight courses plus some smaller bites, will also include pastas like delicate agnolotti stuffed with rocchetta cheese. The agnolotti dish resembles a next-level plate of macaroni and cheese even before it’s kicked into a higher stratosphere with an optional white truffle supplement. The truffle supplement, which will be market price, possibly around $125, will be added when the fall/winter truffle season kicks in and Maude can make it rain truffles the way Stone wants. The supplement will also include white truffle shaved over the to-be-determined smaller bites and also an additional pasta that might be an open-faced, lasagna-style dish. Maude executive chef Justin Hilbert, head sommelier Andrey Tolmachyov, and director of restaurant operations Ben Aviram went to Piedmont for menu research in July. Stone decided to give up his spot on the trip because he was already quite familiar with the region. He used to have a girlfriend in Rome, and they visited Piedmont frequently. (He would like to clarify, though, that this romance was back when he lived in London, long before he met his wife.) Yet Stone’s love affair with truffles began even earlier than that. He was a young cook working for legendary chef Marco Pierre White at the Grill Room at Café Royal in London. A shipment of white truffles arrived, and it was unlike anything Stone, who is from Australia, had ever experienced. “The smell just blew me away,” Stone says. “It was like working with a precious stone. I just fell in love with the flavor.” One good thing about his Maude squad going to Piedmont in July without him, Stone says, is that the trip didn’t happen during white truffle season. So he didn’t have any FOMO about a truffle-hunting expedition. Back when he was running the kitchen at White’s Quo Vadis in London, Stone helped the local Observer Food Monthly newspaper section with a piece about chefs’ favorite ingredients. The story involved Stone going to Piedmont. That’s where he met Alba truffle heiress Olga Urbani and her family. That’s where he marveled at how truffles were found and then made ready for consumption. Even being in a processing room with bags of truffles and watching truffles get cleaned with a toothbrush seemed idyllic to Stone. “If you’re going to be in a factory, this is how to do it,” Stone says. “Just the smell of the room is fantastic.” Meanwhile, truffle-hunting with dogs sniffing around in search of the precious ingredients was an unforgettable experience for Stone. Truffle-hunting happens on wintry mornings. It’s frigid and damp, and you’re getting muddy. “It’s one of the most instinctual things,” Stone says. “It’s freezing cold and you’re bright-eyed with sweaters and scarves and beanies. You’re effectively walking around the woods with a dog and stopping at most trees.” After you’re done, you’ll probably want some pasta, meat, and wine.